Corsair has announced three new additions to its popular Force Series family of solid state drives, including a 40GB version that is being pitched as an ideal Windows 7 boot drive. Corsair's Force Series offered 60GB, 120GB and 240GB, but the company has now expanded the range with three new storage options. Those include 40GB and 80GB SSDs and a 160GB model, offering a broad range for differing uses. The speed of solid state makes it an ideal option for a Windows 7 boot drive, and 40GB should offer a speedy route to your desktop and would handy paired with a bigger storage drive. 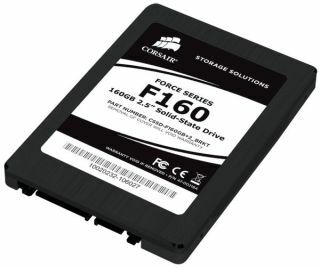 "Unlike most other current generation solid-state drives, the unique architecture of the SF-1200 SSD Processor allows lower capacity drives to perform with nearly the same performance as larger capacity SSDs," explains Corsair. "All three Force Series models support the TRIM command, so write performance is maintained over time." Although we are still chasing a UK price, the US prices are $130, for the 40GB, $230 for the 80GB and $449 for the 160GB version. That would equate to £85, £150 and £295, but add on the usual cross-the-pond fee to that when the drives hit the UK release date of August.